This was one of those pieces of art that generated some strong opinions. At 11 stories high (or 15, depending on your source) it was hard to miss. It seemed that people either loved it or hated it for various reasons, but it was a local landmark. 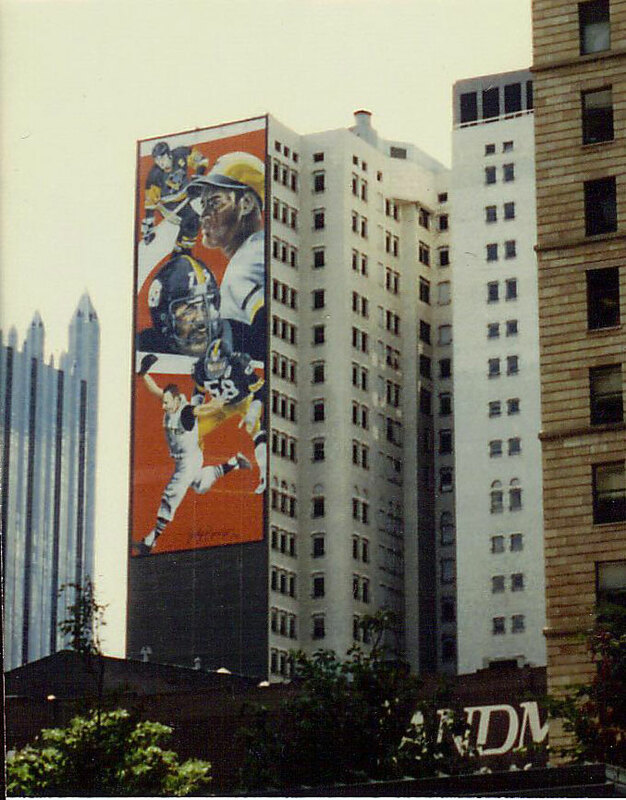 Judy Penzer designed it, and in 1992 it was painted by Gregory Puchalski and Robert Harmon on a building owned by Mz Penzer’s brother. It took them four weeks to finish the mural, working 26 stories up. 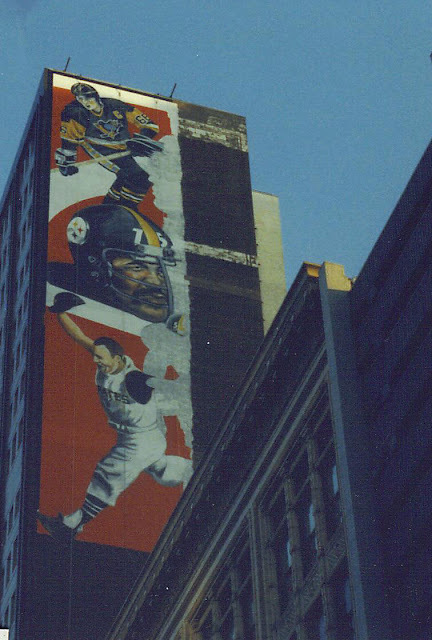 With five of the city’s most beloved sports heroes immortalized on it, the mural didn’t have to be museum quality art for many Pittsburghers to become strongly attached to it. When the building came down in May of 1997 to make way for the new Lazarus Department Store (which of course is now long gone too), there were a lot of unhappy sports fans. They had watched with pride when the images of Clemente, Lemieux, Green, Lambert and Mazeroski were shown on national TV. Broadcasters used to show the mural during breaks in sporting events they were covering here. Loss of the mural hit home. Mr Penzer had sold the building in 1995, and his sister had died tragically in the crash of TWA800 in 1996. 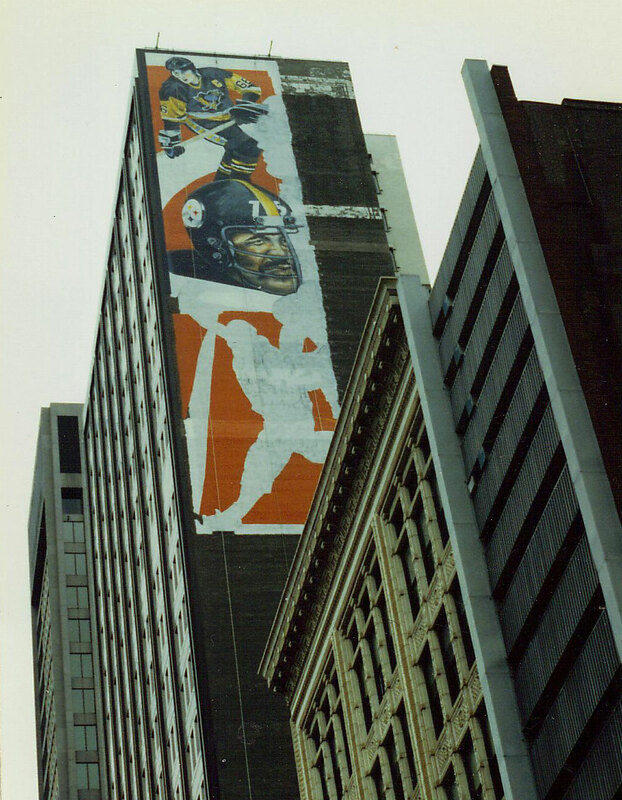 When the building was demolished he still had the original painting and plans used to create the mural. 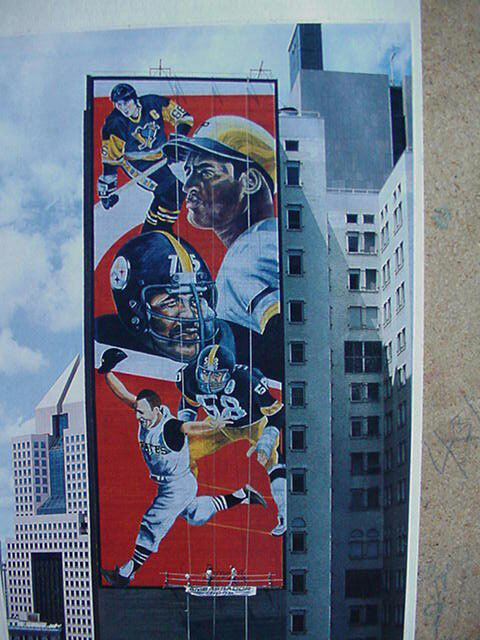 For a while there was some talk of reproducing it on another building in Pittsburgh and Mr Penzer was willing to do that. It never happened though. All of the photos used here were taken/provided by Gregg Puchalski.